Blogger in Draft has just annouced another new amazing feature. The new Blogger Stats feature supports for the blog tracking system where you can track the daily, weekly and monthly stats of your blog. 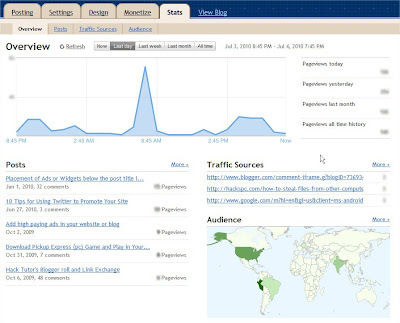 The new Blogger Stats and analyzes your visitor traffic in near-real-time. 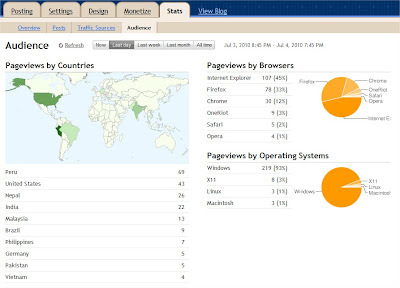 Now, you can check your blog statistics in details and every informatics views. From now, you don't have to use Google Analytic or any tracking system to analyze your blog stats because this feature works better than other trackers. You can track the stats of each and every individual post of your blog which are getting most page views. Also, you can track your back links, how many click is it getting and referred to your blog. You can view your traffic source where your mostly visitors comes from. You can track every popular and most searched keyword of your blog and how many pageviews generated through that keywords. Also, you can check your blog stats in short graph in the Overview page. This new feature also support for the detail information of your blog visitor what kind of browser are they using and which windows they are using. Not only that, You can view the map from Audience page to get the information from which country your visitor mostly coming from. Currently, this feature is only available in Blogger draft. To access this feature to your Blogger draft, Log on to draft.blogger.com You can see the new Stats link on the right. And start observing your blog stats and Enjoy! Share your voice via comment.